Satellites “Aqua” and Suomi NPP on December 28 received images of the southern Atlantic Ocean near the Falkland Islands. 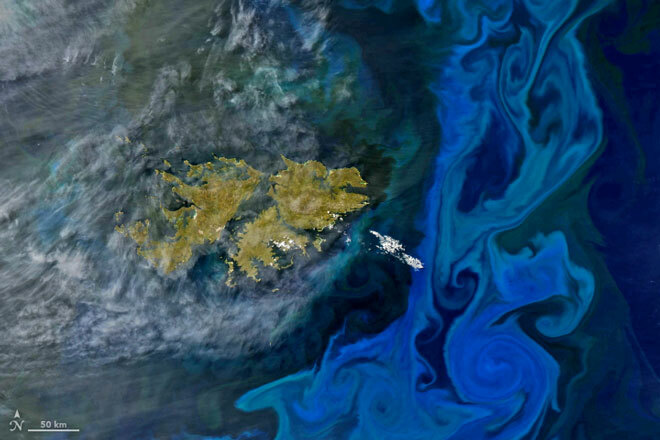 Vortices of milky blue and green, stretching for hundreds of kilometers, indicate the presence of a large number of phytoplankton. White denotes thin layers of clouds. Phytoplankton are microscopic marine organisms that, like terrestrial plants, use chlorophyll to generate energy through sunlight. In the case of favorable conditions, they begin to multiply rapidly and can extend to hundreds of square kilometers of the ocean surface. Phytoplankton is the center of the marine food web, serving as the main source of nutrition for zooplankton, mollusks, fish and large marine creatures. It is also crucial to the global carbon cycle, as it absorbs carbon dioxide from the atmosphere and turns it into carbohydrates. When phytoplankton or animals that eat it die, their remains descend to the ocean floor, transporting carbon. 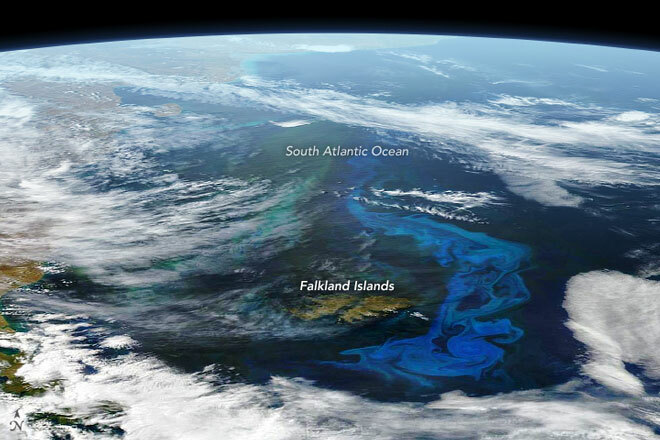 Finally, phytoplankton is a key producer of oxygen, which makes our planet suitable for life. At the eastern coast of South America and the Falkland Islands, in spring and winter, favorable conditions often arise for its development. At this time, the waters are filled with nutrients carried by the Malvinas Current. Occurring from the Antarctic circumpolar current, it flows north and east along the coast. Waters enriched with iron and other nutrients from Antarctica and Patagonia become even more nutritious due to the interaction of ocean currents along the site where the continental shelf rushes down to the deep ocean floor.